August 2014 – Live. Laugh. Love. Lake. Today is last day of August. The MSU Spartans played their opening football game Friday night, tomorrow is Labor Day, and Tuesday Michigan’s public schools are back in session. I can’t figure out where the summer went. For one thing, Winter 2014, also known as the 2014 Deep Freeze, so damaged me (and many, many of my fellow Michiganders, I’m sure) that I really don’t think I’ve even thawed out yet. Plus Michigan summers always seem to fly by. And now another summer is over. But yet… but yet – I’m kind of getting excited for fall. I do love having college football games on TV (even though I rarely sit down and watch them)… I love seeing the colors change… I love fall fashion. I love putting a big pot of chili on the stove in the morning and letting it simmer, filling the house with delicious smells, all day. I love burning fall scented candles (this one from Yankee Candle is my current favorite). I love hearing the leaves crunch underfoot. I love fall baking. Most of all, I love decorating for fall. I’m not one to decorate for every single holiday, but I tend to get pretty into Christmas and fall décor. If budget allowed, I’d go completely overboard but I do have to restrain myself, limiting the fall stuff to the front porch and maybe a bit in the kitchen. This year I’m looking forward to also doing a bit of decorating at the lake house. Definitely not too much, but I’m thinking of doing some mums on the front porch (and maybe the deck too), with some cornstalks and pumpkins too. This was taken in fall 2011. 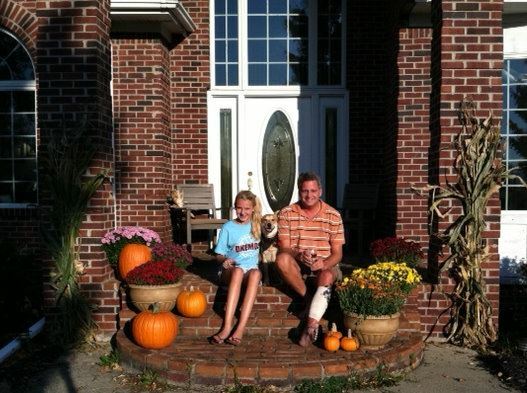 My porch decorating skills have improved since then, but I like this picture because of how the dog is squeezing her head between the two of them. 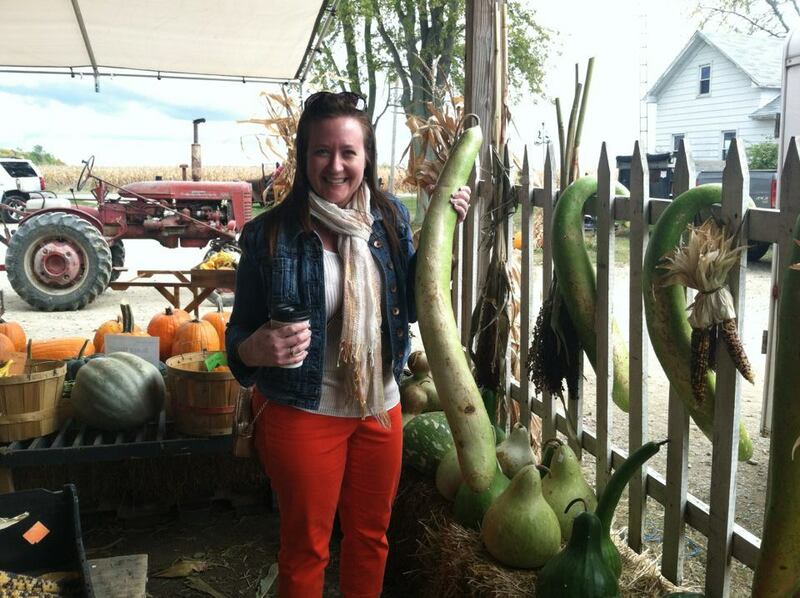 My friend Norma and I discovered the most amazing pumpkin farm, Tomac Pumpkin Patch, not far from our hometown. They grow heirloom tomatoes in gorgeous colors, along with all sorts of crazy gourds. Plus they are very good at displaying their produce and putting together these fabulous stacks of mixed pumpkins, which of course makes you want to buy some so you can duplicate the look at home. I’ve been doing that for several years, and just love the look. 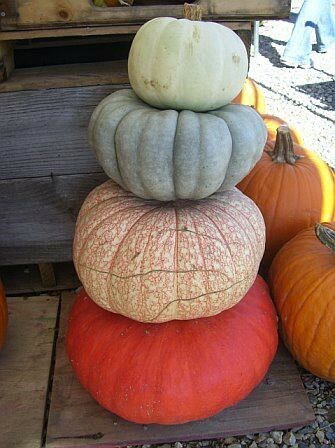 An example of stacked heirloom pumpkins at Tomac Pumpkin Patch. Norma displaying some of the interesting produce at Tomac Pumpkin Patch. 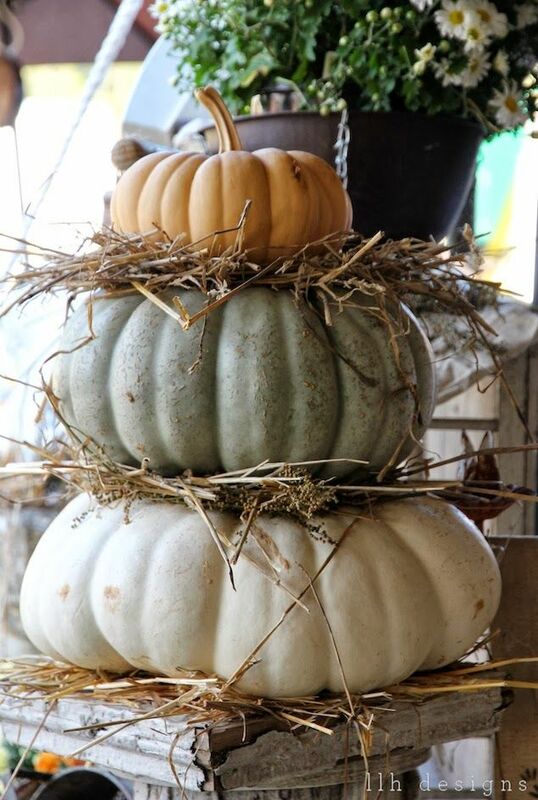 Then I found this pumpkin stack on Pinterest, with straw layered in between the pumpkins. I think the straw makes these stacks so much more fun and fall-y! I’m always amazed at how just the littlest touch can elevate something from pretty good to really special. I’ve also always been drawn to flowering kale as part of fall décor. I love the dark, textured foliage, and they’re just a bit less predictable than mums. If I have time and can find what I’m looking for, I might do something like this in the flower boxes at the lake house. I’m not sure where to find bittersweet though, so I will be on a quest to find it somewhere. Can’t wait to get started! 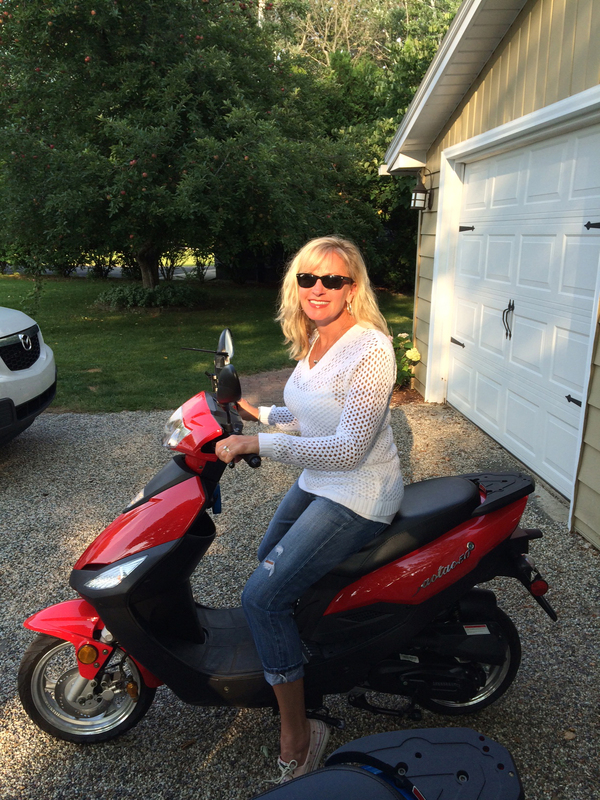 When Rich first brought two brand spankin’ new Mopeds home to the lake house, I was less than thrilled. I guess I’d been damaged from our scooter rental experience in Key West. It SEEMED like it would be fun, but I had a difficult time controlling mine and almost steered into oncoming traffic several times. Plus I’m not a big fan of speed, loud noises or adventure in general. But it turns out, there’s nothing to be scared of on these little puppies! I mean I definitely would not want to be on one in heavy traffic, but they’re perfect for tooling around town. And Spring Lake has lots of little side streets and cute neighborhoods, so it’s really an ideal place to have them. 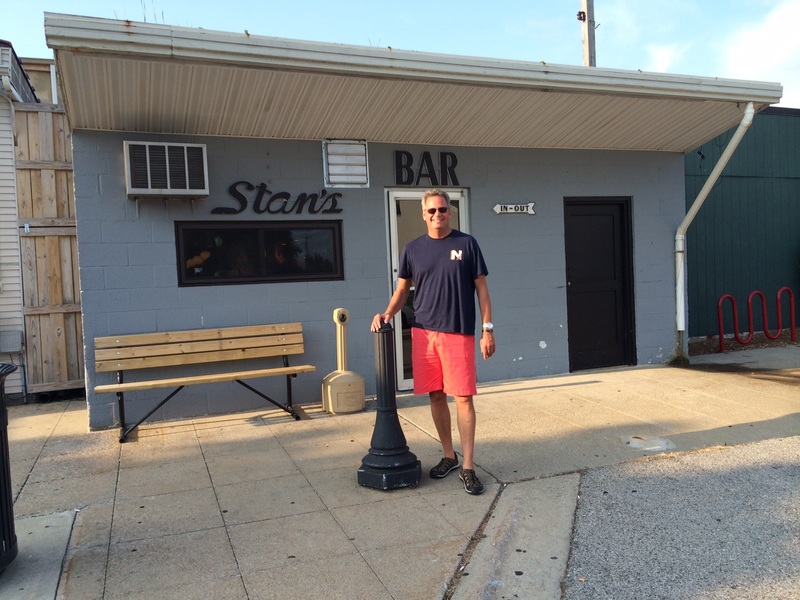 On this particular outing, we decided to take the scooters over to Spring Lake’s popular dive bar, Stan’s. This little watering hole is a favorite among the locals. 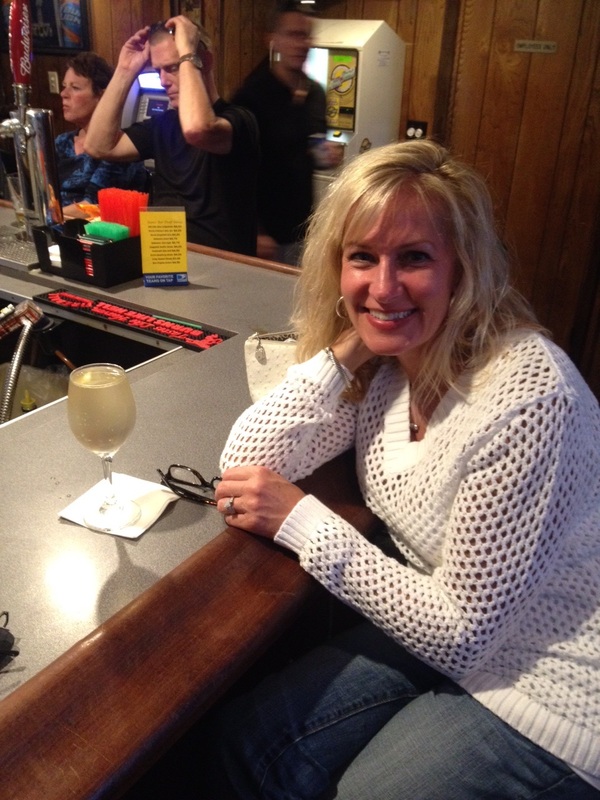 Plus you can order a pizza from the nearby pizzeria, Mamma Mia’s, and they’ll deliver it to you right in the bar! The rear entrance to Stan’s. I didn’t notice the “in-out” sign when I took the picture, but I see now that it’s pointed directly at Rich’s head. I think it’s referring to his listening skills. But I think my favorite thing about Stan’s is the wine pours. None of this fancy pouring until the wine hits the proper spot on the bowl of the wine glass. No, Stan’s bartenders take special pride in pouring to the very top of the glass. It may not be particularly good wine, but you’re going to get a lot of it! Though summer is drawing to a close, I think we still have a good month or so of Moped time left. I definitely want to explore those little lakeside streets and take some pictures, which I will share here. In the meantime, cheers to the wind in your hair, summer days and good pours! I love planting these containers. I started doing these a number of years ago when a friend introduced me to Coleus, which I wasn’t familiar with. I had always done beds and and planters with very conventional plants like geraniums and impatiens. But I got kind of hooked on this darker,”urban” look. These look great grouped in the planters we found at Costco this spring. They’re huge, heavyweight, and at about $40 apiece, a bargain. We sort of spread them across the upper deck at the lake house and then just let them do their thing. Little tip we got from a local gardening guru: fill the bases of huge pots with packing peanuts! 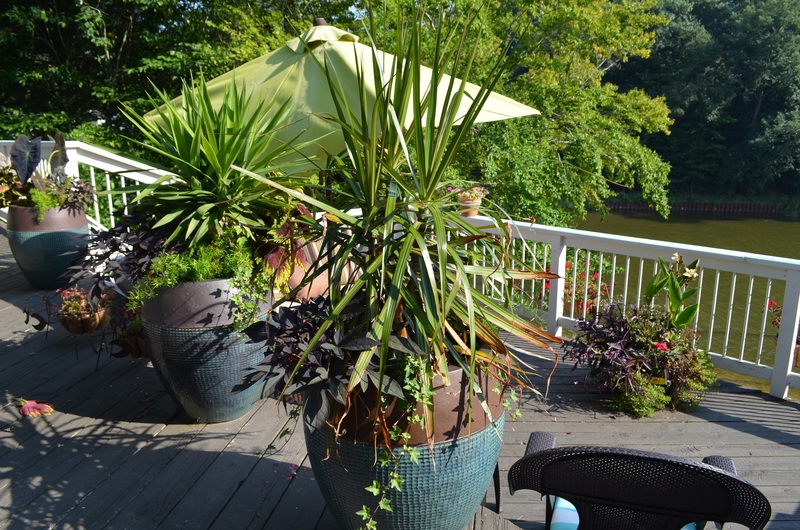 They’re light and do a great job of taking up space in that base that really doesn’t need to be filled with heavy – and expensive – potting soil. I always start with a big anchor plant in the center. In this case, it’s a spiky tropical; Elephant Ears make great anchors too. 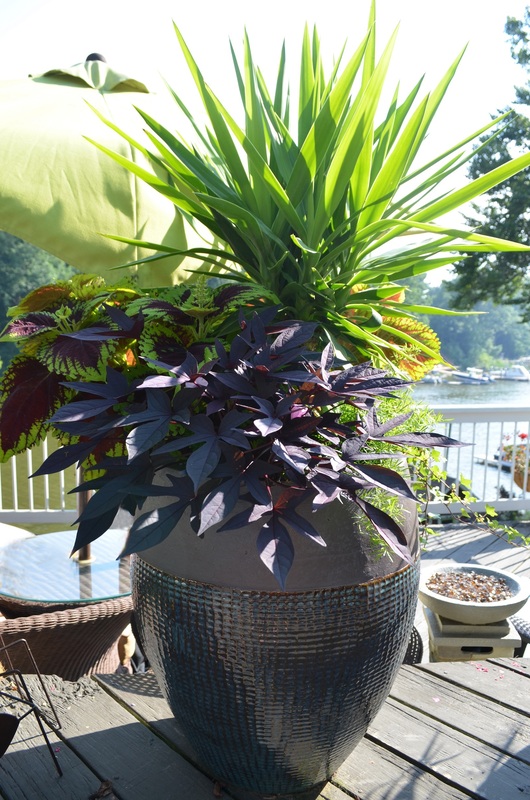 Then I plant fillers at the base – sweet potato vine, regular ivy, Coleus of course, asparagus fern and spikes if there’s room. The goal is a mix of dark, light and contrasting foliage. 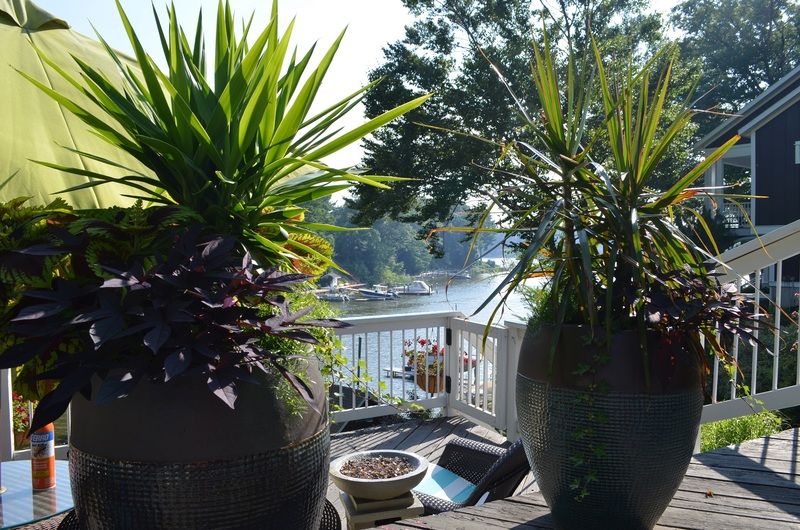 We sometimes move these planters inside and try to keep them going through the winter, but I don’t know if that’s possible at the lake house because there really isn’t enough room for these babies. In the meantime, we’re going to keep them outside to remind us of warm, beautiful days for as long as we can. As much as I love to cook, I love to be outside enjoying my favorite season more. Summers are fleeting in Michigan and weekends are short, so I try to make meals that are quick to put together. 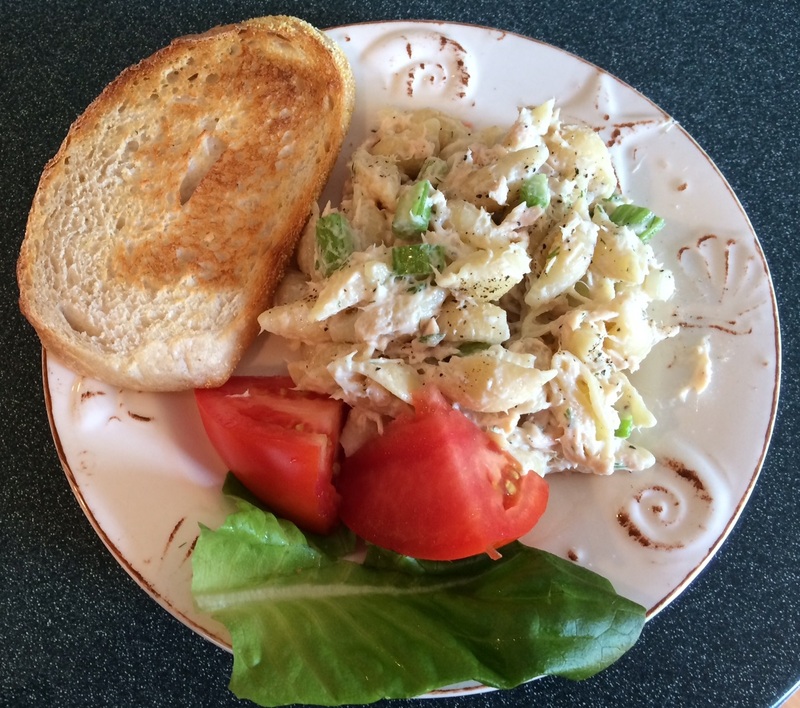 This pasta salad is ridiculously simple but always gets rave reviews. Let’s take a moment to talk about tuna. For years I was a Bumblebee albacore fan, but in recent years I’ve found it to be disappointing. It seems mealy and lacking in flavor. Definitely not worth the price tag. I basically stopped buying tuna for a while, until during one of our Costco visits when they were doing tastings of their Kirkland brand canned albacore tuna. I thought it was so good I bought an eight-pack and that’s what I’ve used ever since. It’s high quality, firm, not watery at all, and delicious. This is such a basic dish it really doesn’t require instructions. 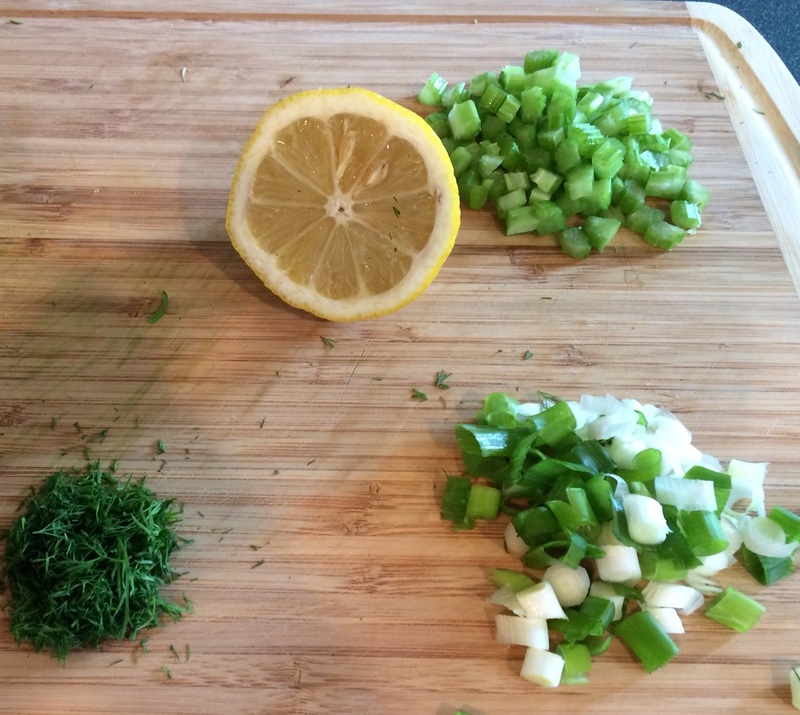 I always include chopped celery, green onions, fresh dill (dried is fine if you don’t have fresh), fresh lemon juice, light mayo, lemon pepper, freshly ground black pepper and a little salt. For the pasta I like medium shells. Dill is one of my favorite herbs. You know how they say that of the five senses, the sense of smell is the number 1 trigger of memories? When I was little we had a next-door neighbor named Mrs. Ring who had no children of her own and treated me like a granddaughter. I spent a lot of time with her (I think most of it was during the summer my mom was pregnant with my brother). She had a vegetable garden where she grew dill for canning pickles. To this day the smell of fresh dill reminds me of my childhood. 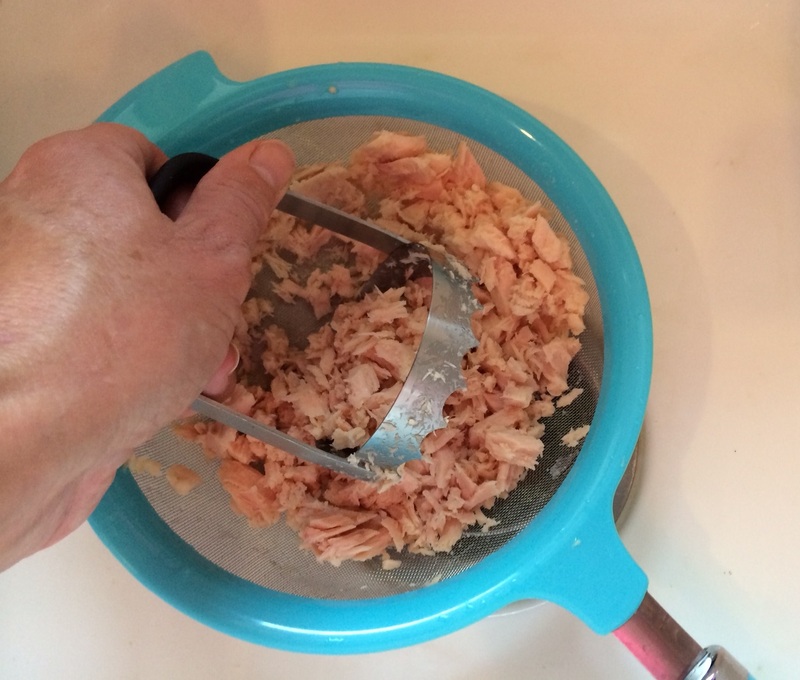 When I drain tuna I use this little gadget to shred it. I don’t like to bite into huge hunks of tuna; I prefer it in little bits. The gadget is similar to one my mom gave me when I first lived on my own. It disappeared last year and I panicked, because I couldn’t find a replacement anywhere. I asked my mom where she got it and she said it was one of two that my grandmother, her mother-in-law, had given to her. In other words, it was a thousand years old and so outdated nobody probably even uses it anymore. But it’s such a handy, simple little tool that really has a lot of uses. It’s a great, low-tech way to give a quick rough chop to just about anything. I searched everywhere and online but wasn’t even sure what to search for. Meat chopper? Tuna shredder? Anyway, I finally found a bunch of them on clearance in Meijer’s kitchen gadget section, so I bought four of them. Sometimes it’s the old-fashioned ways that work the best. Here’s the finished dish. It’s best if you make it ahead of time and refrigerate it for a few hours before serving, so the flavors have time to blend. Enjoy! 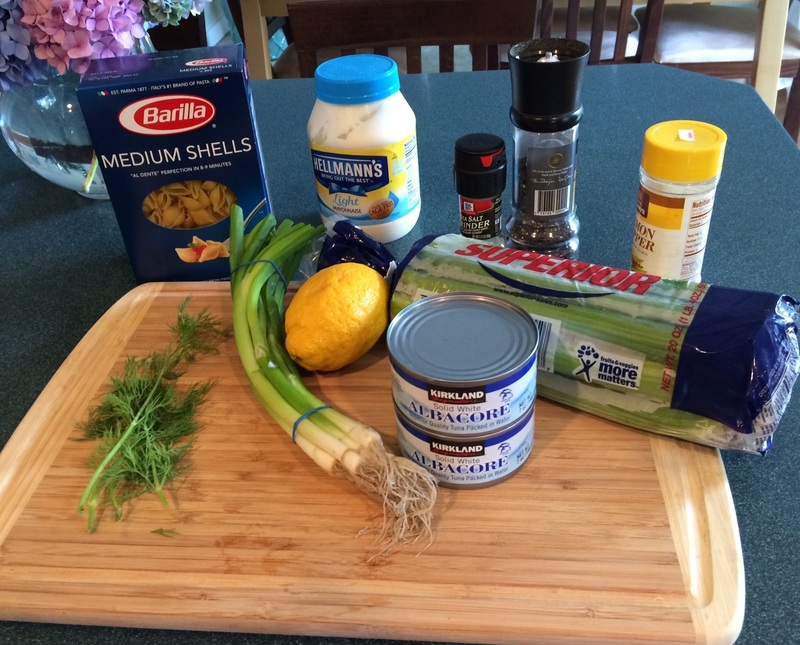 Toss all ingredients together and adjust seasonings to taste. Refrigerate for a couple of hours; serve. Makes about 6 servings.